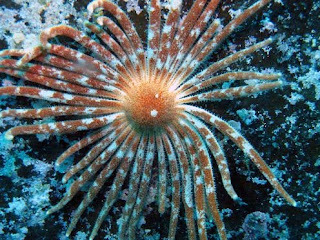 The Echinoblog: Creature Feature: Monster Starfish from Japan!! Plazaster borealis-the Tako Hitode! 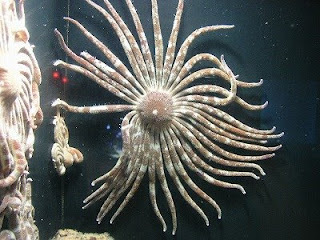 Creature Feature: Monster Starfish from Japan!! Plazaster borealis-the Tako Hitode! Today, another reason why I LOVE the Internet. 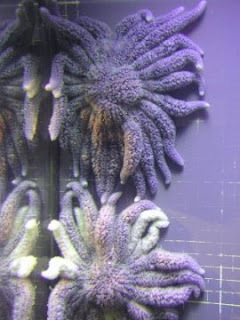 Japanese starfish monsters are sometimes REAL! So, the other day...while looking for something completely else...I ran across some amazing pictures of a species that has almost NEVER been documented in taxonomic monographs! This beast? 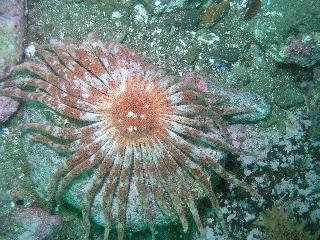 This bizarro shallow-water/subtidal (~20 m depth) species is called Plazaster borealis. The first two characters starting at the left, stand for tako (which means octopus) and the last three characters stand for hitode (which means starfish). So, this translates to "Octopus Starfish"
So, what DO we know about it? very little. It apparently lives in the northern-temperate part of Japan. Northern Honshu to Hokkaido. A full transcription of the original paper by Walter K. Fisher which describes Plazaster can be found here. The genus Labidiaster from the Antarctic/Southern Hemisphere. And who can blame him? Walter differentiated the species from Labidiaster and put it into its own unique taxon and thus Plazaster was born! I'll give credit to Walter K. Fisher's scholarship here. I looked through all of my Latin/Greek dictionaries and I couldn't find what the frak "Plaz-" in Plazaster means! Thanks to Cheryl A. (NMFS) for helping with translations from Japanese! 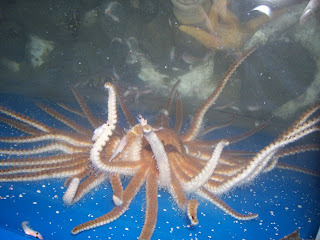 Another Giant Monster Starfish from Japan!! When Sea Cucumbers eat plastic-somethin's WRONG! When scientific names don't make sense!